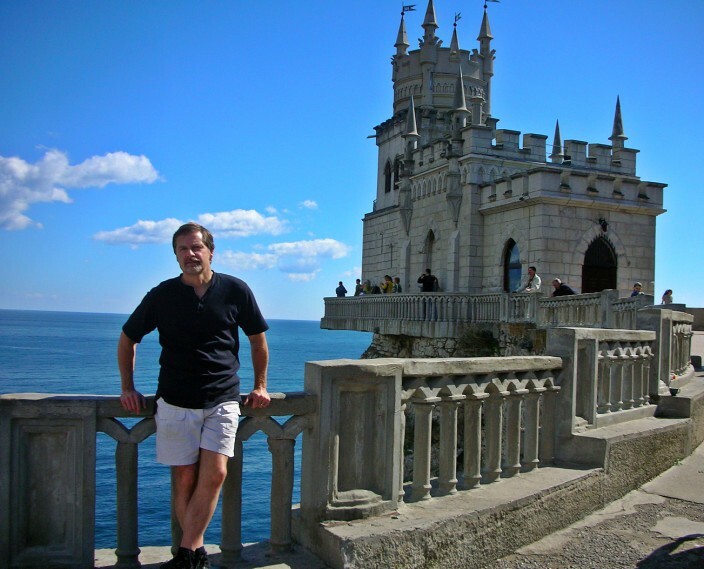 Traveling a few miles farther west of Livadiya will bring you to the Swallows Nest castle, one of the truly iconic and most ubiquitous images of all Crimea. You see it’s likeness on everything: keychains, coffee cups, combs and hairbrushes, shot glasses, wine glasses, beer steins, t-shirts, if you can screen the image on something, the Swallows Nest is on there. When you pay a visit, it’s not hard to see why. 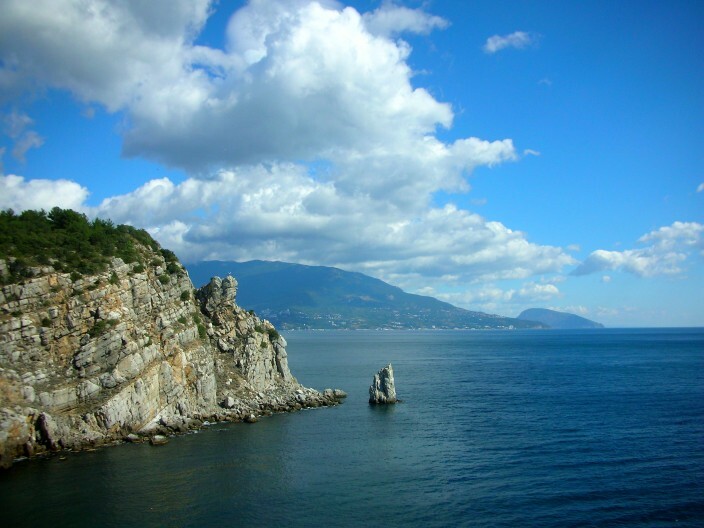 Overlooking the Cape of Ai-Todor and perched dramatically forty meters straight above the Black Sea atop the sheer Aurora Cliff, the Swallows Nest is actually best appreciated from some distance away. Ample photo opportunities can be found on the long walkway and staircases known as the Czars Path, which approaches the castle from the roadway above. It’s really the setting which makes the Swallows Nest such a magnet for tourists as the castle itself is a bit of a letdown when you get out to it. Built in a style I would describe as faux Cinderella/Sleeping Beauty/fairy tale, it’s actually quite small, measuring only 20 meters in length (66 feet) by 10 meters width (33 feet). The Swallows Nest was never intended for residence but rather constructed expressly as a tourist attraction and restaurant. 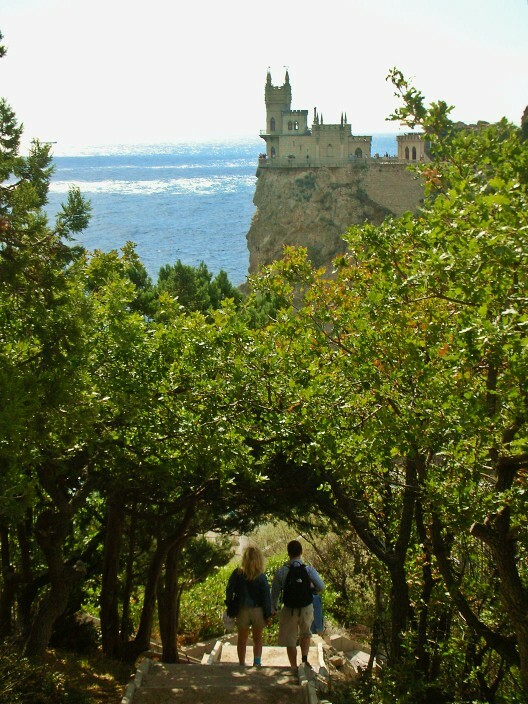 It does feature a commanding view of Yalta to the east, and on a sunny day you can stand along the railing of the observation deck which rings the castle, admiring the seascape and imagining yourself the prince or princess of some exotic land, with dolphins frolicking in the waves below and sea serpents slithering around beneath wooden-masted ships plying the deep blue waters. Or, for those with less imagination, you’ll just see million dollar yachts sailing past and ginormous barges farther out to sea. The dolphins really are there, however, and you don’t even have to look that hard or use your imagination at all to see them. The castle was built in 1911 by Baron von Stiengel, a German who commissioned the Russian architect Leonid Sherwood for the design and construction. In stylistic terms, probably the closest thing I could relate it to is Neuschwanstein Castle (or crazy King Ludwigs’s folly, as it’s widely known) in Bavaria, although Swallows Nest is done on a much smaller scale and comes with correspondingly smaller hordes of tourists attached. In 1914 von Steingel sold it to a businessman who converted it into a restaurant. 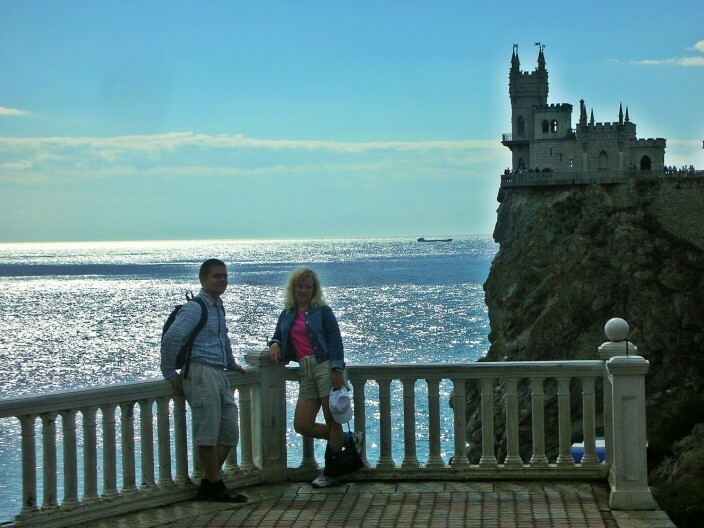 After the 1917 revolution Swallows Nest became strictly a tourist attraction. Then in 1927 a major 6.5 earthquake did little damage to the building itself but caused a serious crack to develop in the cliff. 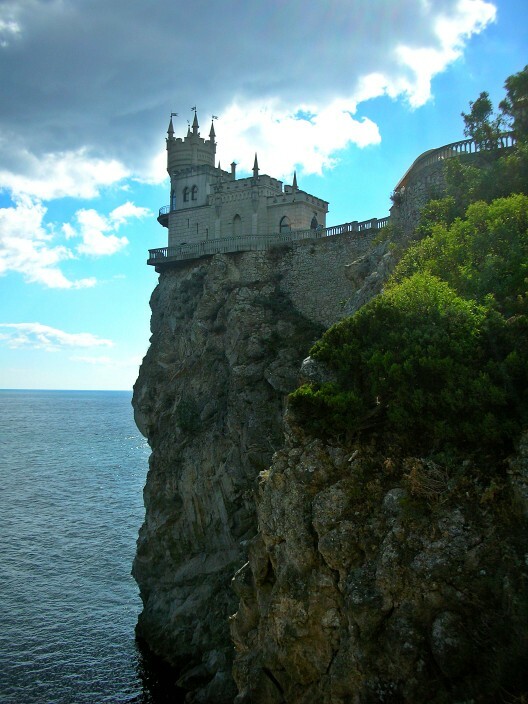 The Swallows Nest was closed down due to safety precautions and remained closed for some forty years. In 1968 a major renovation and restoration project began, including a massive concrete plate being injected to stabilize and strengthen the cliff. 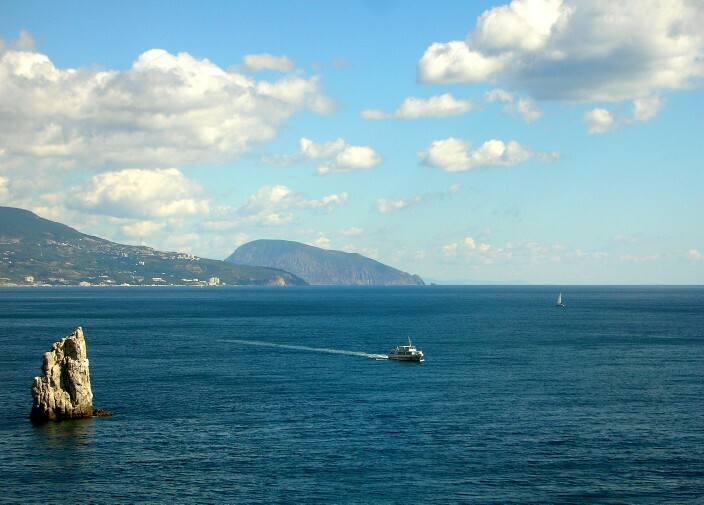 The place reopened in 1975 in an Italian restaurant reincarnation, although it beats me why you would want to travel to Crimea to find an Italian restaurant. They don’t have enough of those in New Jersey? The latest news is that the whole place closed down for three months in 2011 for yet another renovation. 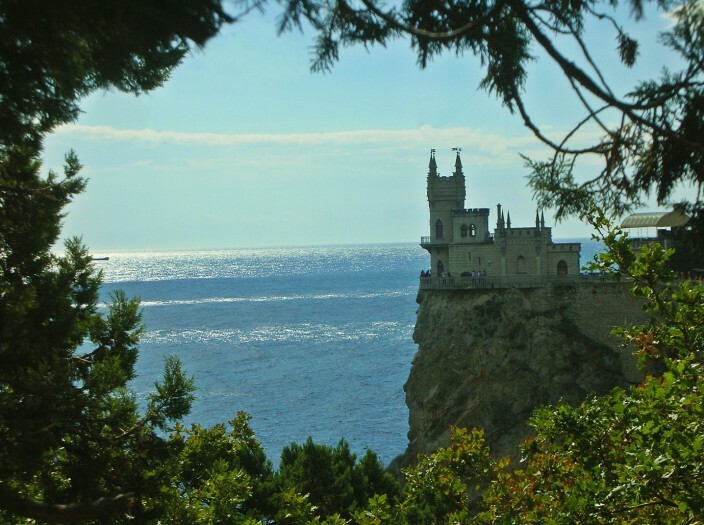 For me, it doesn’t matter all that much what they do with the inside, it’s still worth putting on your Crimean itinerary. Taken together as a day trip with the nearby Livadiya Palace, the way we did, it makes for a fascinating and very full day that you will remember fondly for a long time. Your pictures are so amazing, Greg, and the addition of you and Irina in some of the photos enhances the articles. You’re such a good-looking pair. I hope you are getting a lot of visitors to this.